The Bear Den has been open for about two months and Jay and I have met some wonderful people. We feel truly blessed and embraced by the Suttons Bay, Leelanau, and Traverse City communities. Through our journey, we have discovered some new and exciting local products we will release within the next year and are very excited to share these with you as we continue to expand our collection of unique and reasonably priced gifts, décor, and art. As business owners – and people that care about people – we want to stand by the quality of the products we provide. Jay and I use the products in our store so we can speak personally about our experiences with the products and the best practices/care for the products. Plus – we are passionate about what we sell – what our artists have created and what we can bring and present to you – our customers. So – when I was thinking about what to write in The Bear Den Blog – I knew I wanted the content to be personal, informative, and relative to our friends and customers. I asked myself – what do YOU – our friends and customers - want to know? What are YOU asking? The Bear Den Blog will be about you and the questions you ask. If you have any questions, comments, or suggestions – please post below or email me at info@thebeardengallery.com. This is our opportunity to connect with you, get your feedback, and give you our product knowledge – so please reach out to us! Many customers have seen rain chains on houses but don’t understand what the purpose of the rain chain is, aside from pure aesthetics. The rain chain originates from Japan, where it is called the ‘kusari doi’. Hundreds of years ago, the purpose of the chain was more functional than anything. Made of simple design, these chains funneled rain water from the roof into a barrel. The water collected in the barrel would provide drinking and bathing water for a family’s household. Since its origins, the rain chain crossed to several cultures, including South America where, it has been used as a less expensive alternative to a manufactured downspout. As time went on, rain chains were viewed as not only functional, but also artistic, and the designs became more elaborate, including themed shapes and bells to add the element of sound to the design. What do I place at the bottom of my rain chain? There are several options when considering what should be placed at the bottom of your rain chain. There are decorative options – such as a basin with colorful pebbles – and functional – such as rain barrels. The location and your lifestyle will determine what is best for you. For example – if your rain chain drains into your garden or a mulched section of yard, you may want to consider placing a receptacle at the end of the chain so your mulch is not displaced. If your rain chain is placed over a French drain, there may be no need to have anything at the bottom of the chain. I have listed a few options based on style and functionality below. A Rain Receptacle – this is an extension of the rain chain that attaches simply off the end of the chain. It is a basin for the water to collect in and prevents the erosion of mulch/your garden as the rain collects. It is also a beautiful water feature and adds depth to the chain, as you can hear the beautiful sound of running water into the basin. We offer a rain receptacle at the Bear Den – in the same flamed steel design as our chains. Pebble Mound – You can create your own receptacle using a plastic or metal basin filled with pebbles. This will also help prevent the displacement of mulch. Paver Stones – A less expensive option is to place a paver stone underneath the rain chain. 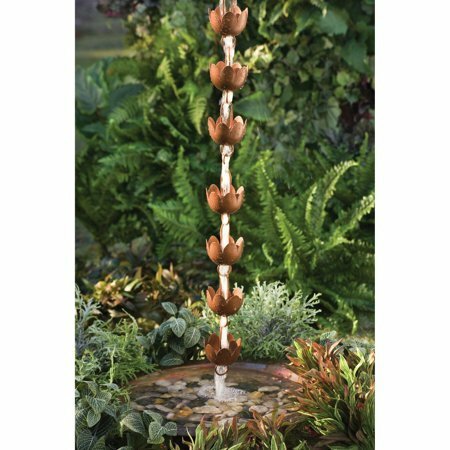 This protects mulch/gardens from becoming displaced, gives a stylish look to the feature, and adds depth to the sound of the water running down the chain. Rain Barrel – Many people use rain barrels at the end of their rain chains to provide an alternative to watering gardens with city water/treated water. Reusing water in this way may reduce the amount of chemicals your garden is watered with and provides a sustainable use for rain water. For the avid gardener, rain barrels could help enrich your crops and assist the environment with sustainable resources for water. We love the information provided on http://www.rainbarrelguide.com/ - this website discusses types of rain barrels, functions, best practices, and can assist you with discovering what rain barrel would be best for you based on your needs. Will my rain chain rust? With proper care, rain chains from The Bear Den will last for a very long time. Our chains come with a protective coating. Just like the finish on your car or any other metal product stored outside, your rain chains may require periodic care to protect against the elements. Please send us an email or call us if you need a recommendation for this. I don’t have a gutter – can I still install a rain chain? Yes. You can either hang the chain as a purely decorative item or you can create an attachment to hang the chain from. https://www.hunker.com/13425662/how-to-use-a-rain-chain-without-having-gutters Has a great article for attaching rain chains to a gutter-less home. The Bear Den is also looking for reasonably priced and easily installed solutions for our customers. Once we have found a solution for gutter-less homes, we will let you know!!! For homes with gutters – each Bear Den rain chain comes with a gutter attachment and instruction for easy installation. Please post your questions or comments below – we would love to hear from you!